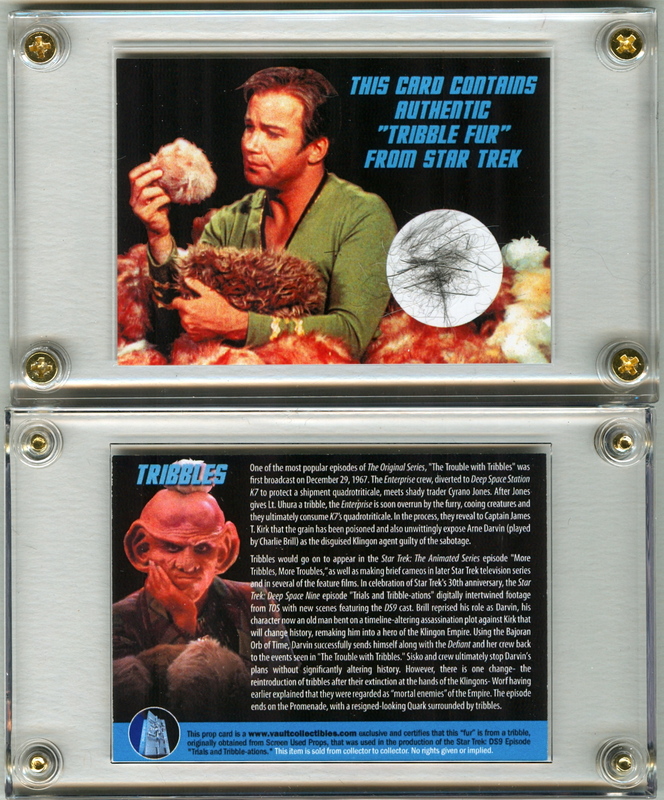 This VaultCollectibles exclusive prop card features “tribble” fur from a tribble used in the filming of the Star Trek: Deep Space Nine episode “Trials and Tribble-ations.” The card is in excellent condition and comes in a screw-down card case for easy display. Amount/placement of ‘fur’ may be slightly different than one pictured but is essentially the same. It will be shipped with the utmost care. One of the most popular episodes of The Original Series, “The Trouble with Tribbles” was first broadcast on December 29, 1967. The Enterprise crew, diverted to Deep Space Station K7 to protect a shipment quadrotriticale, meets shady trader Cyrano Jones. After Jones gives Lt. Uhura a tribble, theEnterprise is soon overrun by the furry, cooing creatures and they ultimately consume K7’s entire supply of quadrotriticale. In the process, they also reveal to Captain James T. Kirk that the grain has been poisoned and unwittingly expose Arne Darvin (played by Charlie Brill) as the disguised Klingon agent guilty of the sabotage. Tribbles would go on to appear in the Star Trek: The Animated Seriesepisode “More Tribbles, More Troubles,” as well as making brief cameos in later Star Trek television series’ and in several of the feature films. In celebration of Star Trek’s 30th anniversary, the Star Trek: Deep Space Nine episode “Trials and Tribble-ations” digitally intertwined footage from TOS with new scenes featuring the DS9 cast. Charlie Brill reprised his role as Darvin, his character now an old man bent on a timeline-altering assassination plot against Kirk that will undo history, remaking him into a hero of the Klingon Empire. Using the Bajoran Orb of Time, Darvin successfully sends himself along with the Defiant and her crew back in time to the events seen in “The Trouble with Tribbles.” Sisko and crew successfully stop Darvin’s plans without significantly altering history. The only real change to the timeline is the reintroduction of tribbles after their extinction at the hands of the Klingons- Worf having earlier explained that they were regarded as “mortal enemies” of the Empire. The episode ends inQuark’s Bar, with the Ferengi surrounded by tribbles. This card is a www.vaultcollectibles.com exclusive and certifies that this “fur” is from a tribble, originally obtained from Screen Used Props, that was used in the production of the Star Trek: DS9 Episode “Trials and Tribble-ations.” This item sold from from collector to collector. No rights given or implied. Wonderful website you have here but I was wondering if you knew of any discussion boards that cover the same topics discussed in this article? I’d really like to be a part of online community where I can get advice from other experienced individuals that share the same interest. If you have any suggestions, please let me know. Thanks!